Today I woke up to an incredible surprise. As I looked at my phone this morning I noticed that one of my photos had been featured across social media by a hotel located in my hometown – Fairfield Inn & Suites by Marriott in Guelph, Ontario. 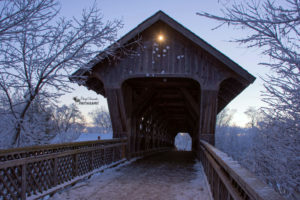 The Covered Bridge is a very iconic location in the city and is a popular destination for photographers. You can watch a video below about the construction of the bridge back in 1992 by 400 timber framers from the Timber Framers Guild of North America. This particular photo was taken while visiting with my family over Christmas. I was driving back to my parents house after having spent the afternoon out with my younger sister. As I was passing by through the outside of the downtown I decided to stop for a minute at the covered bridge. The sun had just started to set and there was a fresh layer of snow that had just fallen. When I approached the entrance to the bridge I was taken aback by the beautiful scene that was right in front of me. The snow had coated all of the surrounding trees and the last bit of sunlight provided a breathtaking backdrop for this photo. As a photographer your primary goal is to have your work seen and enjoyed by others. It is truly a humbling experience to see your photo touch someone and then be shared with even more people who might see it and share it as well. I am truly grateful for this opportunity to have my work displayed across social media. I have included the social media posts from Facebook, Twitter and Instagram at the end of this post. This entry was posted in Nature Photography, Photo Feature and tagged Camera, covered bridge, facebook, Guelph, hiking, instagram, landscape, nature, nature photography, Nikon, Nikon D7200, ontario, outdoors, outside, Photo, photo feature, photo share, Photography, social media, twitter, winter.